Dear visitors of site http://www.ufahomut.ru! 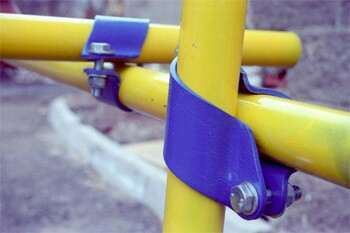 We are glad to offer for sale clamps of novel design. 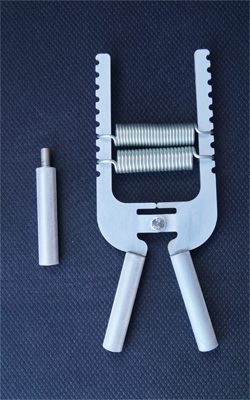 They are intended for assembling Rack-Mountable Attached Clamp Scaffolding (LSPH 2000-40 according to GOST 27321-87), used for laying masonry building walls up to 20 meters height. , When finishing works and facade redecoration are carried out, the height may reach 40 meters. 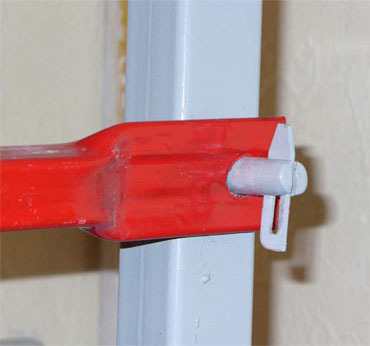 We can also offer extenders or adapters for fastening vertical pipe joints (collet fastening). The clamp is made of rolled carbon steel sheets of ordinary quality St3ps6 or St3sp5 (GOST 380-71) in accordance with requirements of GOST 27321-87. Metal thickness is 5 mm. Weight of one clamp is 0,9 kg, black color, without painting, in oil. For 100 square meters of scaffolding 124 clamps and 12 extenders are required. Along with clamps manufacturing we design and produce articles of precision machinery: dies, various tooling, as well as metalware of thickness up to 5 mm in large quantities. Delivery is carried out by trucking or rail transportation at the expense of a customer. We take upon ourselves duties of production shipping. Our office is situated in the city of Ufa, Republic of Bashkortostan, the South Ural, Russia.